An anodized aluminum keyboard for your iPad with built-in speakers that connects with a hinge for nearly 180 degrees of positioning. Director Brad Leong (Dorfman in Love) asked me to write an "Apple-like" piece for their Kickstarter video. 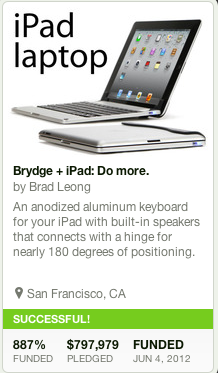 Brydge went on to be one of the most successful Kickstarter campaigns to date, raising $797,979! I'm sure it was because of the music.